Silicone products can prove excellent tools for the kitchen – the properties of the material are perfect for cooking and for handling hot pans. Silicone rubber can resist temperatures from -55°C to +300°C without being damaged, making it the perfect material for cooking. It is a polymer which makes it non-reactive, stable and easily shaped. Here are some simple yet cool silicone products that are designed for the kitchen. The silicone pan holder is a very simple square shaped silicone mat that is used to handle hot pans and lids while cooking. The heat is not absorbed by the silicone mat, making it a very safe tool for use when cooking at home. and handling hot items. This silicone mat can be used for several purposes such as opening bottles and canisters. It can also be used as a way to protect countertops and table surfaces when serving hot pans and dishes at the dinner table. This item can be found in many shapes, such as heart, fruit shapes, or other geometric figures. Any shape and size of silicone mats can be easily manufactured. The silicone oven mitt is a more advanced product for oven mitts in the market since the material can withstand such high temperatures & the mitt will not burn and deteriorate. It can be used on either side with the same heat resistant capabilities. Usually, oven mitts were made with some kind of heat resistant material, but after extensive use, some of them lose there heat resistant capabilities and start to deteriorate. This will not be the case with the silicone ones which will be very useful for handling hot trays coming out of the oven! Looking to offer your customers a unique exclusive item? Check out these promotional silicon gloves. Here are some other silicone grips that are more original – shaped like animal heads. In the picture, you can see samples with the head of a shark, a frog and a pig. All types of animal shapes can be made for this product. Making a mould for silicone products is very easy and many shapes such as Mascots could be made. This is a highly customizable product idea. A kitchenware company can offer a unit of this silicone holder as a GWP campaign for the purchase of a frying pan or other cooking products. Use these promotional silicon gloves! The lemon squeezer is of great use when needing to extract juice from a lemon without getting your hands covered in lemon juice. 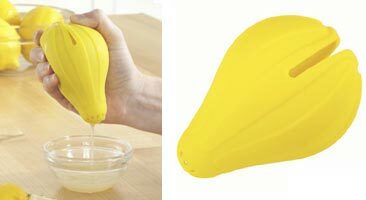 This silicone cover is very practical as the lemon is cut in half and is placed inside the silicone product. At the bottom small little holes let the juice flow out of the silicone squeezer. Great kitchen product so that your customers don’t ever have lemon juice on their hands again. Looking for alternatives for promotional silicon gloves? Check below other options. 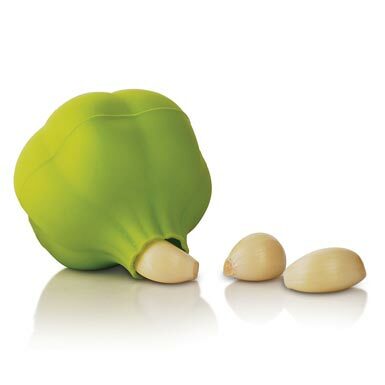 A very similar type of product is used to peel off the skin from garlic cloves. The clove is placed inside of the silicone product, the skin will automatically peel off by repeated friction against the silicone material. This is an easy way to peel the skin off garlic, much simpler than letting customers use there finger and fingernails. Don’t let your customers have a hard time cooking make it easy for them by offering these great silicone promotional products. Make cooking easy for your customers with all these fun products. 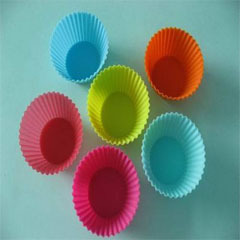 Silicone cake moulds are the best in the market, any shape can be made to make fun and cool looking cakes. The mould is very easy to use numerous times as it cleans very easily by hand or in the machine. No problem baking cakes or cupcakes with the silicone since the material can withstand temperatures up to +300°C. These cake moulds are more practical because the nature of silicone will prevent the cake from sticking to the mould, unlike with paper or other material moulds which can sometimes be quite difficult to separate once the cake is ready to eat! Silicone products can be made in infinite amounts of shapes, sizes, colors and designs. Customize kitchen silicone products to match vegetables, fruits, animals and corporate or sports mascots to offer as gifts to customers. These products will be a hit when bundled as a GWP campaign with kitchen accessories. How can ODM help you? Keen on making your very own custom promotional silicon product? Contact ODM for any requests for manufacturing and designing all types of silicone products. The product designers in our team will be able to provide you with multiple unique ideas to wow your audience. Our specialists will be able to assist you every step of the process and ensure a pleasant experience. Giving away daily household necessities is a great way to get noticed by the public because it would probably be something they are looking for or need in their house. What makes you stand out from the crowd more is to have a unique gadget that wows your audience. Check out this blog to learn more about this unique collapsible mini colander and why we love it!